Click on the topics below or submit your own question. What is the Tongass 77? Why is it called the Tongass 77 (or, "T77")? How did the Tongass 77 come about? Does the Tongass 77 only matter to fishermen, Alaskans or outdoorsmen? If Tongass salmon are thriving, why is the Tongass 77 needed? How would the Tongass 77 actually conserve salmon? Won’t the Tongass 77 essentially block any development from approximately 1.9 million acres of the Tongass National Forest? 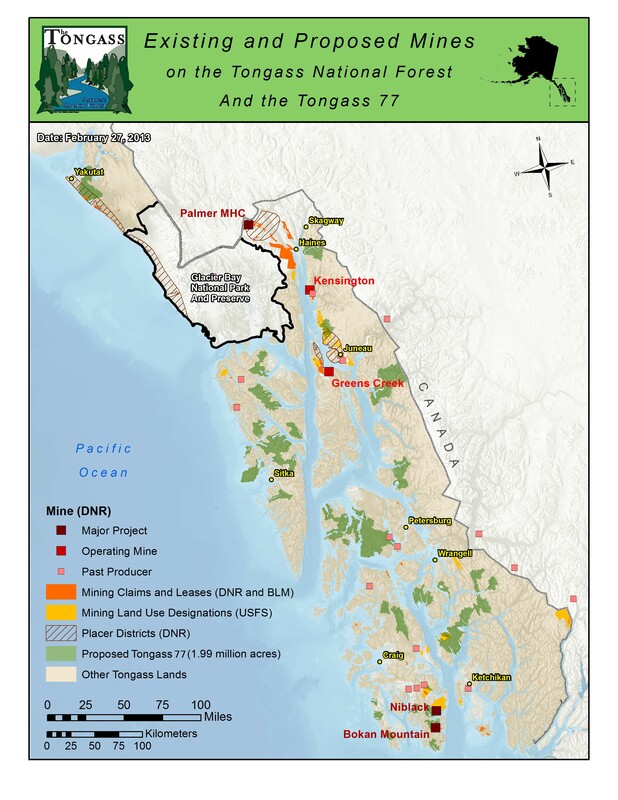 Why does the Tongass 77 seek to conserve whole watersheds? Aren’t the tree buffers that must be left along salmon streams enough to provide protection to fish? Is salmon really enough of a cash cow to warrant measures like the Tongass 77? Is the Tongass 77 going to harm the timber industry? Is the Tongass 77 necessary given the conservation restrictions already in place? Question: What is the Tongass? Answer: The Tongass National Forest is the country’s largest and wildest national forest. It’s a rare temperate rainforest representing less than three percent of all forest cover on Earth. The Tongass contains nearly 18,000 miles of rivers, lakes and streams which produce tens of millions of salmon and trout each year. The Tongass is America’s only salmon forest that remains biologically healthy for these unique fish. While the Tongass’ salmon are abundant now, there’s work to be done. A: You can have your business sign the petition, you can take action by commenting on the new Forest Service Plan and you can tell your friends about this website or to check us out on our Facebook page! Q: What is the Tongass 77? A: The Tongass 77 is an effort led by Southeast Alaska commercial and sport fishermen and other conservation-minded individuals aimed at persuading Congress to increase conservation measures for the best wild salmon and trout habitat in the Tongass. By habitat, we mean the forest and freshwater systems that produce these fish. At present, 65 percent of salmon and trout habitat in the Tongass National Forest is not protected from development at the watershed scale. Q﻿: Why is it called the Tongass 77? A: It’s called the Tongass 77 because when this proposal first originated it included 77 separate watersheds. After legislation in 2014 privatized some of those watersheds, and added new conservation measures for others, the Tongass 77 proposal was reduced to 70 watersheds. We have since added 3 new watersheds to ensure the proposal still represented a broad cross-section of the best salmon streams. While the Tongass 77 is a bit of a misnomer now that the proposal contains 73 watersheds, the name has stuck. Q: How did the Tongass 77 come about? A: The Tongass 77 emerged from extensive scientific research and collaboration. Over five years, a team of scientists from Audubon Alaska and The Nature Conservancy conducted a conservation assessment of the Tongass. The goal was to map the ecological condition of Southeast Alaska. In March 2007, the team produced a report called The Coastal Forests and Mountains Ecoregion of Southeastern Alaska and the Tongass National Forest. The report identified an uprecedented opportunity for conserving the Tongass' ecological integrity while sustaining local economies and the high quality of life in Southeast Alaska. The report found that the long-term productivity of Tongass fish and wildlife hinges on balancing development with conservation, including conserving entire watersheds. Trout Unlimited used the report as the basis for further analysis which identified over 70 watersheds﻿ as the highest-value salmon and trout watersheds that remain open to development and in need of Congressionally-designated conservation measures. Q: Does the Tongass 77 only matter to fishermen, Alaskans or outdoorsmen? A: Definitely not. Anyone who values fish, enjoys eating wild salmon, viewing or hunting wildlife, touring wild places, or simply likes knowing they’re out there, has a stake in what happens in the Tongass. It is public land and it is an internationally significant forest. The Tongass represents some of the best our country has to offer — it belongs to every American. Managing these Southeast Alaska watersheds for their most important asset is a wise investment for all Americans. As Southeast Alaska cultural anthropologist Richard Nelson has stated, “Tongass salmon rivers are like money in the bank. They are a diverse portfolio that if carefully managed pays huge dividends every year. This natural salmon bank is highly perfected and cannot be improved upon. But it can be easily squandered.” Nelson refers to salmon as God’s capital. “This is one issue — if there ever was one — that can bring diverse Alaskans together on. Everyone one of us can gain immeasurably by taking care of our salmon,” Nelson says. (Watch the video.) Everyone should stand behind the Tongass 77 and push Congress to pass it. Q: If Tongass salmon are thriving, why is the Tongass 77 needed? A: Tongass salmon and trout face a variety of threats from impacts associated with land privatization initiatives, hydro power generation, mining, timber harvest and climate change. Together, these threats represent a potential repeat of the “death by a thousand cuts” scenario that has diminished salmon and trout populations across the world. The Tongass 77 proposal is a proactive conservation measure designed specifically to head-off the gradual decline of salmon and trout that’s been repeated so often elsewhere. Q: How would the Tongass 77 actually conserve salmon? A: Federal legislation to permanently conserve the Tongass 77 is the way to ensure the long-term productivity of these important salmon watersheds. Maintaining natural salmon production and the health and function of fish and wildlife habitat would be the top management priorities. Q: Won’t the Tongass 77 essentially block any development from approximately 1.9 million acres of the Tongass National Forest? A: What it would do is lock in a self-sustaining resource which contributes an estimated $1 billion to the region’s economy year and employs about one in 10 people. In essence, conserving the best fish watersheds helps secure the livelihoods of the estimated 7,300 people associated with the Tongass’ salmon and trout fisheries. The Tongass 77 is an effort to guarantee the highest and best use of a very small portion of the roughly 1,000 watersheds that make up the Tongass National Forest. Q: Why does the Tongass 77 seek to conserve whole watersheds? Aren’t the tree buffers that must be left along salmon streams enough to provide protection to fish? A: At present, logging is prohibited within a minimum of 100 feet of all larger salmon streams (Class I and II streams) in the Tongass. This is good and may be sufficient for some streams but more can and should be done for the long-term sustainability of the most productive Tongass salmon and trout watersheds. Trout Unlimited has compiled an 88-page literature review that documents the ever-expanding rationale for why conserving entire salmon watersheds from ridge tops to river mouths makes sound scientific sense. The report concludes that full-scale watershed conservation is the best way to preserve both habitat diversity and natural processes critical to salmon and trout. Q: Is salmon really enough of a cash cow to warrant measures like the Tongass 77? A: Yes. Tongass salmon are the linchpin of the regional economy and represent one of the last great wild salmon fisheries on the planet. According to a study commissioned by Trout Unlimited, Southeast Alaska salmon and trout in 2007 provided more than 10 percent of regional jobs and supported almost a $1 billion industry that includes local commercial, sport, hatchery and subsistence fisheries. In 2011, Southeast Alaska produced the largest salmon harvest in the state, with fishermen catching some 73.5 million fish. Wild salmon harvested from the Tongass represent approximately 70 percent of all wild salmon harvested from our national forests, roughly 28 percent of Alaska’s overall salmon catch, about 30 percent of the salmon caught on the West Coast of the United States and close to 13 percent of the salmon harvested on the Pacific Rim. Q: Is the Tongass 77 going to harm the timber industry? A: No. Although the Tongass 77 accounts for 1.9 million acres of the Tongass National Forest, only 69,500 of these acres are within the existing Tongass timber base of 539,000 acres under the current Tongass Land Management Plan. The 469,500 acres remaining in the timber base provide ample opportunity for a sustainable timber industry. Q: Is the Tongass 77 necessary given the conservation restrictions already in place? A: Current safeguards for Tongass salmon are only temporary and can change under each new administration and with every Tongass Land Management Plan revision. The Tongass 77 would provide permanent Congressionally-designated conservation measures for these important watersheds.